it’s been quite a busy week for me but I managed to find at least some time to read and collect some articles for you. Thanks for the ongoing support and the growing list of subscribers to this weeklyish summary! Chrome 33 introduces custom elements (part of Web Components), which is pretty cool, unprefixed pageVisibility API, drastically improved web font downloading. Bootstrap now has an official Sass port. Firefox DevTools News: Node Picker gets new position and other improvements. Unfortunately there’s no mention to support calling it with a keyboard shortcut as it’s possible in Chrome (cmd + Shift + C). The Guardian has all front-end code on GitHub. A great resource to look at. Principles for making things on the Web. Some Design and Development Standards to align and guide your project. Very extensive and helpful list for your workflow. Did you know that you could pass through parameters to PhantomJS? For example you can disable loading images to prevent Timeouts. Testardo is a browser and OS agnostic web driver for mobile and desktop. Trello sped up their board loading time in one week. And they documented what they did and what they achieved in a small diary. 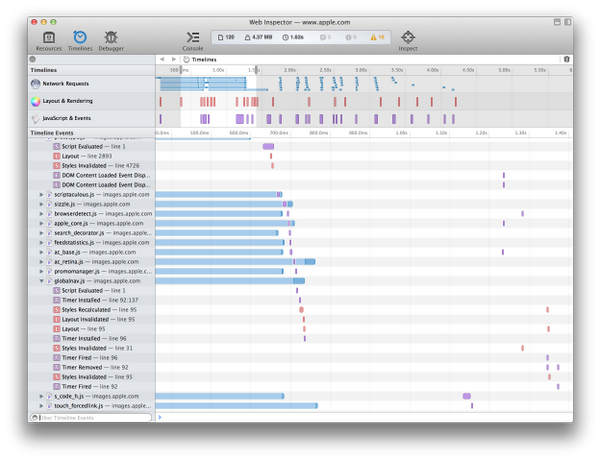 WebKit Nightly now has a resource level timeline and a per-call site timeline in its Inspector. Very good for a performance analysis! Groupon published their testing framework Testium. A modern scale for web typography which proposes you good scaling values for Desktop, Tablet and Smartphone font-sizes. Sass Animation Studio by Rachel Nabors is a hell of a tool to create CSS based animations. Very useful! You can now use JSON in Sass with Hugo Giraudel's SassyJSON. If you're a Sublime Text user, you probably wanna give Sublime CSS Completions a try. I love conferences and I hope you, too? If so, here is a guide where you could go in the next few months.